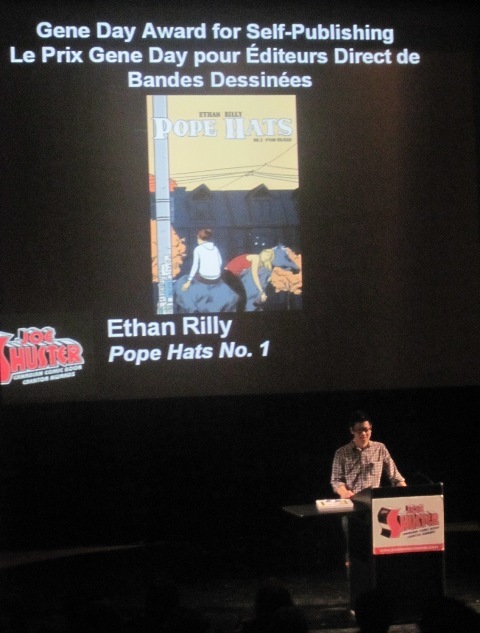 Photo: Ethan Rilly accepting the 2010 Gene Day Award and $500 bursary for his self-published comic Pope Hats No.1 at the June Joe Shuster Awards ceremony. Hey all you self-publishers of comics/comix/zines, we’re nearing the end of 2010 and it’s time to submit your self-published comics for consideration of the 2011 Gene Day Award. The Gene Day Award for Self-Publishing honours Canadian comic book creators who self-published their work during the previous calendar year. The award includes a bursary of $500. In order to qualify you must be a citizen and current resident of Canada. Anyone who writes and illustrates a comic book of their own creation (includes creative teams) and publishes and sells that comic independently of any other publishing company and did not currently have said works originally distributed by a third party distributor may submit their publication for review. Format and content is at the discretion of the creators but the work must include new content, not reprinted material from other sources (such as webcomics). All entries will be reviewed by an independent jury. Entries will be judged individually based on originality, literary and artistic merit, and overall presentation. There are no language restrictions for this award. PO BOX 67031 – 2300 YONGE ST.
We maintain a list of self-publishers, and maintain a list of Gene Day submissions, with links to your websites and blogs. This is to support the creative efforts and provide recognition for the work being done. This entry was posted in Gene Day Award, General Announcements by Robert Haines. Bookmark the permalink.